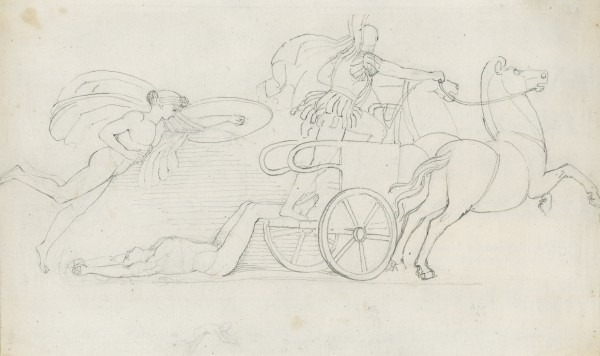 John Flaxman's style was the embodiment of the Neoclassicalism; clean lines and uncomplicated composition defined his oeuvre. The influence of antiquated Roman and Greek style is very evident throughout Flaxman's work. Mythical and historical scenes are played out within in both his drawings and sculptures and a sense of drama and narrative flows through each. In response to the over-complicated Rococo style of the early 18th century, Neoclassicism was relatively minimalist, using clean lines, realistic features and limited decorative backdrops to focus the viewer's attention on the figures in the scene. 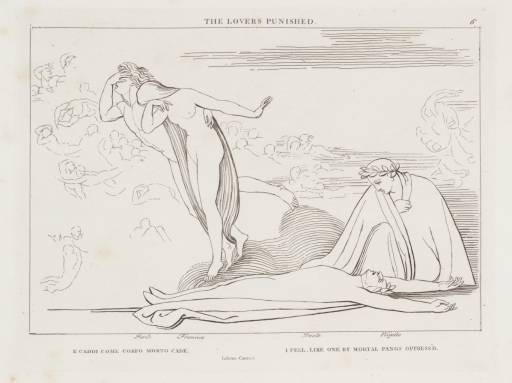 Themes of love, drama, heroism and pride were frequently used by Flaxman to ensure that his art had a moral purpose that reflected his Christian beliefs. Flaxman produced designs for Wedgwood's Jasperware in the form of wax reliefs. Examples include The Dancing Hours, which demonstrates the delicate nature of Flaxman's designs and the way in which he portrays a narrative scene, without use of background or props. Flaxman used limited color in all of his works. Wedgwood's 18th-century Jasperware mainly featured colored backgrounds in shades of lapis blue, green, black and light blue. The ceramic reliefs were then layered on top in cream or white which made the designs stand out. This simple elegance brings out the beauty of Flaxman's designs. Flaxman's ceramic reliefs are full of movement and he uses the Grecian costumes of his subjects to add depth to the piece, each drape showing the way in which the figures body is moving in the scene. Each ruffle of fabric is seen so clearly that it is almost a snapshot in time. Almost one-dimensional, these reliefs have a flat quality which adds to their ethereal beauty. 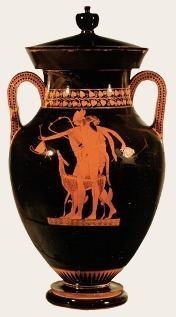 Flaxman drew inspiration from classical Greek red-figure pottery. The use of carved relief brings out the detail in the scene and in the clothing and hair of separate characters, rather than adding depth to the overall design. Although many of Flaxman's sculptural works are made from marble, carving this material was not one of his most prolific talents. The design of the piece was where Flaxman really excelled. He often left the unfinished marbled to be completed by his assistants but this often led to criticism about the quality of his finished works. In Flaxman's time, creative and poetic talents were generally considered to be above the manual work of carving the sculpture. Flaxman's Pastoral Apollo was one of his most successful sculptures. However, the marble has not been worked in order to differentiate between the skin of the figure and his clothes, etc. This gives the piece an otherworldly feel and takes away some of the emotion behind its design. 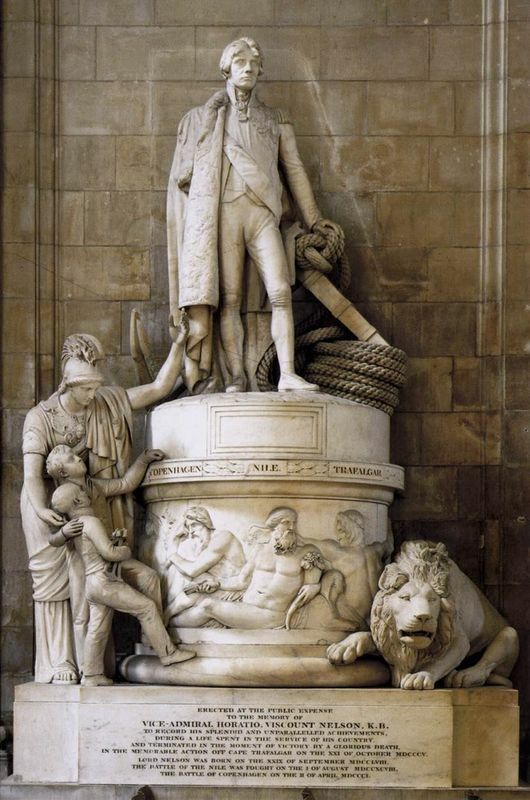 Some of Flaxman's sculptures-in-the-round, such as his Monument to Lord Nelson and that to William Murray, have been criticized for being too heavy and it's been said that the natural flow of the composition was ruined by bulky pedestals and overbearing secondary figures. The use of uprights to keep a sculpture such as Cephalus and Aurora from collapsing, creates awkward lines and unnecessary supports in the piece. 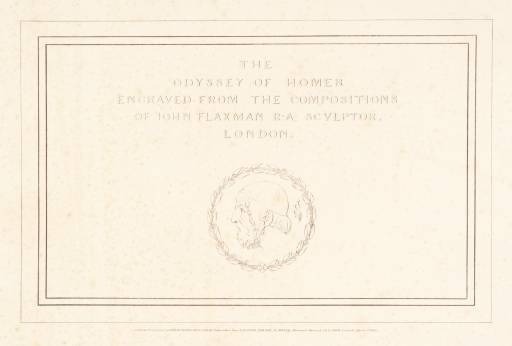 Flaxman started producing illustrations for epic stories and tales while in Italy, his most successful pieces being Dante's Divine Comedy and Homer's stories of the Iliad and Odyssey. In comparison to Flaxman's work in ceramic design, many of his illustrations have a far more complicated composition. The illustrations represent scenes form ancient stories and in many cases a large amount of text needs to be included in just one plate. Flaxman doesn't use any color in these pieces - they were purposely designed in black and white so that they could be mass produced. This is in keeping with Neoclassical design and similar to the artists' designs for Wedgwood. The use of horizontal lines in the background adds shadow and depth to the drawings which are really only two-dimensional, almost cartoon-like in some aspects. Objects or figures in the background of a scene are shaded darker than those in the foreground and this is carried on throughout his works so that the viewer may instantly recognize the perspective of any given scene. Flaxman creates movement in the stance of the subjects in his illustrations - their feet lifted as if they are walking. Horizontal lines are once again used to indicate movement.